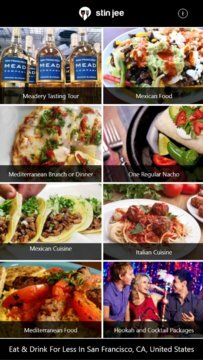 Published by Stin Jee Ltd.
Want to find food and drink deals right now? STIN JEE will show you EXCLUSIVE real-time dining deals and drink specials available near you. No sign-up required, simply download our FREE app, and browse the deals right now! STIN JEE uses the location services facility on your mobile device to find participating restaurants, bistros, cafes, pubs, and fast food outlets that are offering special menus for lunch, dinner or meal deals for Stin Jee users. The beauty of the STIN JEE app, is that it finds the nearest restaurant deal or bistro dinner special to wherever you might be. Don’t fancy what’s on the menu? Just pinch-outwards and more special deal menus from other restaurants, bistros and dining outlets will be listed. Tapping on any restaurant’s special offer will open the details screen. This shows a bigger picture of the deal, with a more detailed description, the dinner menu, the prices and fine-print, together with the name and exact address of the restaurant or bistro and how far it is from your current location. Having chosen a special deal that you like, you can tap each and any of four buttons on that deal screen. You can follow directions to your chosen dining-out establishment, call up the restaurant or bistro using your device’s voice calling facility, maybe share the details of the particular bistro’s special dinner deal menu with your Facebook friends and you can also link directly with the restaurant or bistro website. 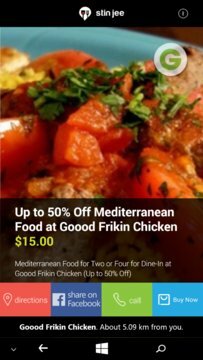 In some cases, you will be able to buy an electronic coupon for the special, which you will need to book your discounted meal, or you will have to present to the restaurant to take advantage of the special. Once you arrive for your meal deal, you just show the waiter the special deal screen on your phone (or show them the coupon, if you bought one), and you’ll get the special dining price at the Stin Jee price. Special menus and dining deals remain on Stin Jee for a week at a time, once any participating restaurants and bistros have uploaded them to our system. * (NEW) We’ve integrated Groupon food and drink specials, to give you more choices. * (NEW) We’ve changed the design of the app. * When you first launch the app the nearest deals show up instantly in a thumbnail grid, sorted by closest restaurant first. * Only specials in a 30 mile radius are shown. * You can change the location to see specials in other cities (for instance, if you’re planning to travel). * You will receive notifications it there are new specials near you. * Scroll through thumbnails to choose the best dining deal for you. * Choose a thumbnail and all the deal details are easily available. * Take your mobile device to the restaurant offering the deal and show the screen to the waiter or manager to claim your special menu deal. * It’s, quite literally, as easy as pie! Note: Continued use of GPS running in the background can dramatically decrease battery life. STIN JEE has GPS running in the background to find local special deals on food and drink.